There is a really cool book release I want to tell you guys about. The book is called If I Could Climb Trees, by Jeff Minich. And illustrated by Renan Garcia. This is the fifth volume in the Nuggies series. The book is set to release on March 28, 2017. The book sees the return of a little dog named Coco, since this is the Volume V of the series. The little dog dreams of big things. And dreams of all the creatures she could meet and see if she could climb trees. She imagines she can climb to the top of a very large tree and once there meets animals, such as a squirrel, ladybug, ant and even a caterpillar! She discovers that all the other creatures she encounters have their own little dreams too! 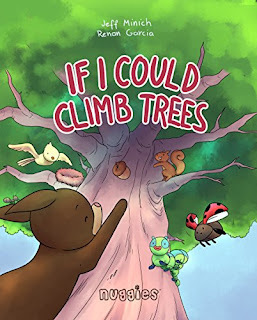 If I Could Climb Trees, is filled with wonderful, vivid & colorful illustrations. It would be a great bedtime story book for children. And encourages kids to explore their own imaginations in a whimsical way. And allows children to dream big dreams of their own. Also allowing them to see the world through the eyes of others. Here is a quote from the author Jeff Minich: "I'm so pleased to share this latest Nuggies story. It takes children on a fantastic journey while also encouraging them to consider the world through many different points of view. Building empathy and understanding for others is a key theme of the Nuggies book series, and one that is woven throughout this latest book."